Overview of haze-forming pollution and the EPA's Regional Haze rule to reduce haze in national parks and wilderness areas. Haze-forming pollution comes from both human and natural sources. Windblown dust and soot from wildfires contribute to haze, as do motor vehicles, electric generating facilities, industrial fuel burning, and manufacturing operations. Pollution from particulate matter (PM) is the major cause of reduced visibility (haze) in the United States, including many of our national parks. While some haze-causing particles are emitted directly to the air, secondary particles can be formed when emitted gases form particles well downwind of the emission sources. Nitrates and sulfates are examples of secondary particles that contribute to haze. Some of the pollutants that form haze have also been linked to health problems and environmental damage. In many scenic areas, the visual range can be substantially reduced by air pollution. In eastern parks, average visual range has decreased from 90 miles to 15 to 25 miles. In the West, visual range has decreased from 140 miles to 35 to 90 miles. Haze is measured in deciviews (dv), which is a unit of visibility proportional to the logarithm of the atmospheric extinction. Figure 1 compares extinction (measured in inverse megameters or Mm-1) to deciviews to visual range (measured in kilometers or km). One mile is equal to approximately 1.6 kilometers. Figure 1. Comparison of Extinction, Deciviews and Visual Range. Source: William Malm, Introduction to Visibility , 1999. 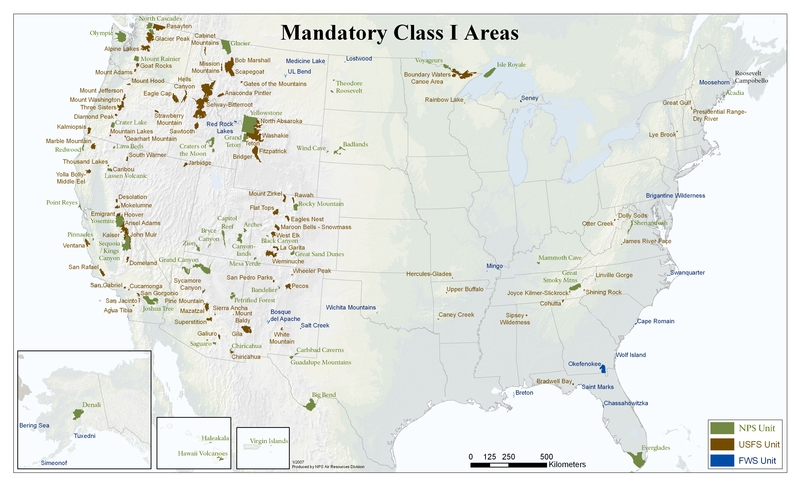 The Regional Haze Rule (PDF file), issued by the U.S. Environmental Protection Agency in 1999 with updates issued in 2017 , calls for state, tribal, and federal agencies to work together to improve visibility in 156 national parks and wilderness areas known as Class I areas (Figure 2). The rule requires the state to consult with the EPA, the National Park Service, the U.S. Fish and Wildlife Service, the U.S. Forest Service, other states, and tribes. All interested parties are able to comment on proposed Regional Haze revisions to the SIP. The national map of all 156 Class I areas is available from the National Park Service. Texas has two Class I areas: Big Bend National Park and Guadalupe Mountains National Park. On a clear day at Big Bend, visitors can see the detail of large objects over 100 miles away. On a hazy day, the view can be reduced to 30 miles. Use the Big Bend National Park Data webpage to retrieve monthly summaries of hourly average data collected at Continuous Air Monitoring System (CAMS) 691 and to see photos. View monthly summaries of the hourly averages for all the pollutants and meteorological conditions measured by the TCEQ at a selected monitoring site. Use the Guadalupe Mountains National Park Data webpage to retrieve monthly summaries of hourly average data collected at CAMS 5018; no photos are available at this time. Limited summaries are available of the hourly averages for all the pollutants and meteorological conditions measured by the TCEQ.